The Schooner Wharf was originally located on the Schooner Diamante, the bar moved ashore, where the top shelf liquor was kept in the top drawer of a filing cabinet! The bar has evolved into a very special place over the years. It has expanded into a neighboring building and added a second-floor deck with a beautiful view of the classic yachts of Key West's Historic Seaport; available, like the bar's dining room, for private parties. Although it has become a favorite of visiting celebrities suchThe food here is really good!! as Beach Boy Al Jardine, the bar has never lost the rustic charm and warmth that made it the saloon of choice of treasure salvor Mel Fisher, who often referred to it as "A treasure." "This must be the center of the universe," echoed the late broadcaster/author Charles Kurault after his visit to the bar. Voted Best Local's Bar six years in a row, the Schooner Wharf has been acclaimed in such diverse publications as the New York Times, and Aqua magazine, for its unique nautical decor, music and food, and open-air proximity to sweet ocean breezes. Fresh stone crab claws, peel-and-eat shrimp, fresh-shucked oysters, and, of course, conch chowder and fritters, are among the local seafood delicacies on the menu in the galley. Chicken wings, eight-ounce burgers, and juicy steak sandwiches are always on hand for the land-lubber. It's never dull!Planning a party? The galley's chefs love to cater any sized event. The friendly bar staff are always pleased to serve up specialty drinks such as Schooner Lemonade, Rumrunners and Mango Daiquiris; the featured libations during the bar's three happy hours: From 8 a.m.-noon, 5-7 p.m., and 2-4 a.m. But the fun doesn't end there. 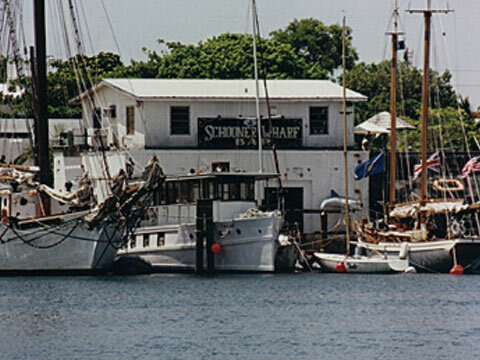 The Schooner Wharf Bar is the site of numerous special events throughout the year, including the Lighted Boat Parade, in December, the Minimal Regatta, over the Memorial Day weekend, Wrecker's Cup Race Series, Barbecue Cook-off, Chili Cook-off, and one of the Keys' favorite local events, the Battle of the Bars. True fans of the open water, Schooner Wharf owners Evalena and Paul Worthington, are also planning to host a classic wooden boat show for the near future, now that they've completed extensive renovations to their beautiful 46-foot ,1930 Dawn motor launch "Coquille," which is available for short trips and harbor tours. Feel like going for a sail? The bar is the home port of the Key West The Western Union!flagship Schooner Western Union, available for sunset cruises and private parties. The 130-foot-long tallship is a floating historical testament to the island's shipbuilding heyday, and one of the last working schooners built in the U.S. Not content with these two grand old boats, the Worthingtons recently added to the bar's fleet by bringing the majestic Schooner America to Key West. A most historically significant vessel, the 139-foot America is a replica of the original Schooner America; commissioned to be built by the New York Yacht Club for the 100 Guinea Cup in England in 1851. The fastest boat on the water, America won the contest by such a huge margin, that race organizers renamed the event the "America's Cup" in her honor. Tour this magnificent and historic vessel, or hire it here for a cruise toDance all night! the Caribbean! Rates are available for dockside parties and private charters, and it's sure to become a popular setting for weddings and receptions. As a live music venue, the Schooner Wharf Bar is without peer. With special guest musicians such as E Street Band Saxophonist Clarence Clemmons, jazz great Othello and legendary bluesmen Big Jack Johnson and Johnny Johnson stopping in to play, you never know who you're going to hear. Happy HourDon't miss quintessential musical storyteller Mike McCloud during the day, and nighttime favorites the Key West Soul Party, belting out classic Motown and funk music. And yes.... dancing is encouraged! Think you know your share of card tricks? Think again. Ten minutes of watching wise-cracking "bar magic" expert Frank Everhart Jr. will send you back to the drawing board. The son of one of sight magic's true pioneers, Everhart can be found most nights in his corner of the bar entertaining people from all over the world. So, pull up a barstool, order an ice-cold beer and strike up a conversation with the person next to you. You'll never cease to be amazed by the characters you meet at Schooner Wharf Bar; a last little piece of old Key West you'll want to return to again and again.